Mosaico 1.8.4.X versions had a huge adoption rate and a spike in downloads. Thank you! Some users have reported issues, mainly due to the new inter-process-communication (IPC) module. The new IPC offers a new level of compatibility with apps, but it’s a lot less road-tested compared to the previous 6 years old module. Fixed a bug with overlay appearing erratically during normal operations with MS Office and others. Fixed a bug with transparency not being set correctly. Fixed a bug with “Always on top” option not working sometimes. Small tweaking of user interface. As usual you can wait for Mosaico to auto-update, or you can go to www.soulidstudio.com/download/ to manually download the new version. If you own Mosaico on Steam your copy should be automatically updating soon. Please remember that you can run your Steam copy without running the Steam client itself. You can also use the license key provided by Steam to register the retail version! If your trial has already expired, please feel free to contact us to require a trial extension! I’m happy to announce that a new update of Mosaico is available right now at www.soulidstudio.com! New “Borderless Windows” feature. If you are into gaming, it is now possible to run your games fullscreen in a borderless window. This means easier ALT+TABing out of gaming window and complete multi-monitor support. New “Mouse Locking” feature. You can lock mouse pointer to your borderless windows. Handy when a game requires interaction near the screen edges. WIN key is now a global shortcut modifier. You can also select from 0 to 4 modifiers (CTRL, ALT, SHIFT, WIN) to optimally configure your favorite shortcuts. Improved compatibility. Mosaico now works fine with Acrobat Reader, VLC, Ninja Trader, JRiver and many others, thanks to a completely rewritten inter process communication schema. Many bug fixes and improved speed. Fixed a crash when dragging windows across multiple screens in Windows 10. Fixed several other smaller issues. Mosaico should be automatically updating soon to the latest version. You can also update manually by visiting http://www.soulidstudio.com/download/ . One of the best satisfactions of this job is to hear from you about how Mosaico is useful in your everyday work. How it has changed the way you organize your daily activities at the computer. Your feedback is fundamental. It drives the development and motivates my collaborators and me to do a great job. During these years very often I’ve heard about users who were happy with Mosaico but not very keen on investing money on it. License price could be steep for a student or for a home user. I firmly believe that the purpose of one’s job should be to bring wellness and happiness to others, as it will eventually come back in the form of wealth and appreciation. So I’m very proud to announce the new Mosaico Free Edition, available now at www.soulidstudio.com. This edition is available for free, it never expires, and it’s for you to use wherever and whenever you desire, for non-commercial purposes. We’ve also extended the trial period of Mosaico Pro Edition from 14 to 30 days! PRO Personal is offered at the same price of the Standard one, but only until March 6th. So hurry up if you were planning to join Mosaico supporters by buying a Pro license! If you are already a supporter, your license will be automatically converted to a Pro Personal. Mosaico should be automatically updating soon to the latest 1.8.3.0. If not, please visit http://www.soulidstudio.com/download/ to manually update. Mosaico new version 1.8.2.0 is available! A new release of Mosaico is available for download at www.soulidstudio.com. New feature to automatically restore a snapshot when Windows starts. New feature to replace current snapshot with a new one. This saves you from manually deleting current snapshot. Automatic updates. Mosaico will notify you when a new version is available and will optionally download it in background. External GUI and Windows libraries updated. Fixed a bug with windows resizing slightly smaller on Windows 10. Fixed a bug with windows resizing on the wrong monitor when maximized. Fixed a bug with layout shortcuts order not being saved. Fixed a bug with systray message always being displayed. Fixed a bug with Mosaico window disappearing while dragging icons to change snapshots positions. http://www.soulidstudio.com/wp-content/uploads/2015/08/logo141x60.gif 0 0 admin http://www.soulidstudio.com/wp-content/uploads/2015/08/logo141x60.gif admin2016-02-06 21:59:482016-02-06 21:59:48Mosaico new version 1.8.2.0 is available! – New feature to import and export snapshots. Save your snapshots on a file and load them on another PC to have the same work environment. – New feature to import and export settings. Export your settings to another computer or just save more than one profile to use on the same PC. – Change settings folder. You can set Mosaico to store snapshots and settings in a folder of your choice. For example a shared folder over a network. – Fixed a bug where recycled windows handles may cause restored windows to be swapped. – Added an installation option to select data folder when installing. – A new web setup file is available, that is much lighter to download. Old offline installer is still available. – install the new version. If you own Mosaico on Steam your copy should be automatically updating. If you don’t own a license of Mosaico yet, you can try this new version for an additional 14 days period! The new licensing system that will open a lot of new possibilities for bringing Mosaico to your company is almost finished, please stay tuned! If you own Mosaico on Steam this system will allow you to run Mosaico without running Steam client. A new bugfix release of Mosaico is available for download at www.soulidstudio.com. – Fixed a bug where some snapshots were not restored using the full screen area in the monitor hosting a Windows taskbar (you will need to capture the snapshots again). – It is now possible to disable the exit confirmation dialog. – It is now possible to disable docking&tabifying when Mosaico is near screen edges. – Added a “Please wait” message when a snapshot is being restored. – It is now possible to activate and register Mosaico via email, for PCs not connected to the internet. 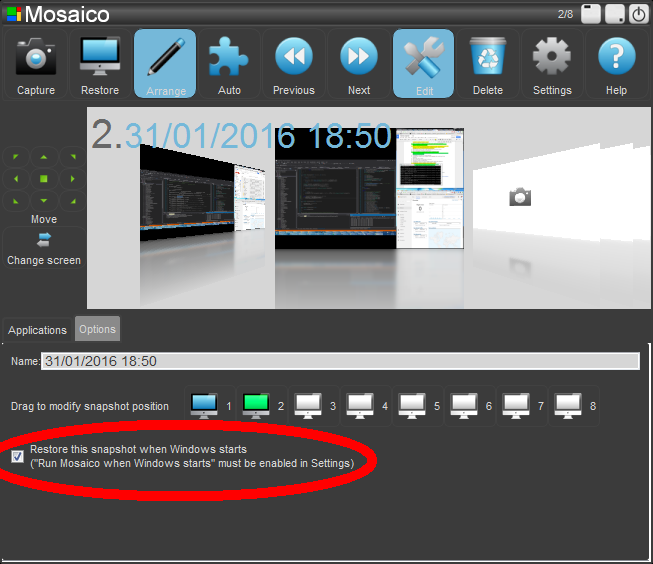 – fixed a bug where snapshots were incorrectly restored if the user positioned windows using built-in Windows arrangement instead of Mosaico’s one. – fixed a bug where snapshots were incorrectly restored if the user changed Windows taskbar position. If you don’t own a license of Mosaico yet, you can try this new version for additional 14 days! A lot of new features are coming in the near future that will improve your experience with Mosaico. Stay tuned! A new version of Mosaico is available for download! This new 1.8.0 version introduces several new features and fixes various bugs reported from the previous version. If you own a license you can upgrade for free. Just uninstall your current version, reboot your computer and install this new 1.8.0 version. If you have already tried Mosaico in the past but your copy has expired, you can download this new version for an extended 14-days trial period! You can download Mosaico 1.8.0 at http://www.soulidstudio.com/downloads/mosaico_setup.exe. Snapshots have now a fixed, customizable, position, so they are more easily restored via key shortcuts. New options make snapshot restoring customizable. It is now possible to set command line arguments for each app in a snapshot. Command line arguments are captured as well. It is now possible to apply activate/delete actions to a selection of apps instead of one by one. It is now possible to assign a name to a snapshot. Better performance in user interface and in restoring process. Improved algorithm to match windows on screen with the apps in a snapshot. It is now possible to choose which layouts to display on screen when arranging. It is now possible to choose which layouts to use when arranging via hotkeys. Pressing “Q” will cancel current arrangement (same as “right mouse button”). Snapshots will now adapt to a new screen resolution when it changes. Layouts are now displayed on screen in a less cluttered way. Snapshots are now correctly saved on exit. Fixed a bug with maximized windows. Fixed a bug with arrangement overlay appearing only the first time on Windows 8.1. Fixed a bug with “skewed” layouts after resolution changing. This version introduces several changes, but many more are going to be implemented in the near future. If you’d like to suggest a feature, or report a bug, please feel free to contact us at info@soulidstudio.com of on the Mosaico community pages on Steam. Mosaico is a tool created to improve your experience when working at the PC, so every suggestion is welcome! Enjoy your copy of Mosaico! A new version of Mosaico is available for download at http://www.soulidstudio.com/downloads/mosaico_setup.exe. This new 1.7.1 version is a maintenance release that improves performance and fixes a lot of bugs while retaining all the new features introduced with version 1.7.0. All layouts icons are displayed while arranging. A quick guide to get yourself started with Mosaico. If you already own a license you can upgrade for free. Just uninstall your current version, reboot your computer and install this new 1.7.1 version. Enjoy your copy of Mosaico and please feel free to contact us info@soulidstudio.com.